A well preserved, nearly complete skeleton of a new extinct species of pheasant that lived between 7 and 11 million years ago adjacent to the northeastern edge of the Tibetan Plateau in China preserves the oldest evidence of a bird having modified and specialized its vocalization sounds (songs or calls). Everyone is familiar with birds singing and making a variety of sounds, such as roosters crowing at dawn. However, little direct evidence exists for how extinct birds sounded, but this new skeleton from China begins to change that story. The Chinese fossil named Panraogallus hezhengensis preserves a windpipe (trachea) that is extremely long (longer than the bird's body), and it was coiled into several loops outside of the chest cavity (see photo of the fossil and an artist’s reconstruction of the whole skeleton with the windpipe). While the windpipe itself does not produce sounds, birds with a very long windpipe make sounds that are louder and lower in frequency than birds of a similar size with a typical length windpipe. This kind of windpipe elongation is known in about 60 species of birds today including cranes, ibises, and even some Birds of Paradise in New Guinea. However, Panraogallus is the oldest record of its occurrence in birds, and the first record of a super long windpipe in pheasants, a group of birds that is very diverse in China and across Asia today. It appears that birds evolve these hyper-elongated windpipes in order to sound like a larger-sized bird (who make relatively louder and lower frequency sounds). This change is similar to the evolution of a long windpipe in various mammals for much the same reasons (recently covered in the press). See a recent publication in Nature Communications about the mammalian equivalent (https://www.nature.com/articles/ncomms12739). "This bird’s windpipe is special because it coiled around at least twice outside of the chest, and it looks like it might have even looped back towards the leg before returning back up to enter the chest cavity and attach to the lungs," said Chinese paleontologist LI Zhiheng, lead author of the study published in Scientific Reports. "The discovery of this super long trachea in a pheasant, which don’t have long windpipes today, suggests that the story of the evolution of bird song is much more complex than what we think now based only on living species,” said coauthor Thomas Stidham, an American paleontologist based at the Chinese Academy of Sciences in Beijing. “The fossil also shows the struggle to sound like the best, biggest, or baddest bird has been going on for millions of years." The species name of this extinct bird Panraogallus hezhengensis means coiled chicken in reference to the coiled windpipe and its close affinity to living pheasants; and Hezheng, the town in Gansu Province, Western China where the fossil was found. The elevation of Hezheng today is over 2000 meters (more than 6000 feet), and it is adjacent to the high altitude Tibetan Plateau. This bird fossil was found in the yellow and reddish clay that is famous for the many three-toed horse or Hipparion fossils. Based on estimates from the skeleton, the pheasant weighed about 2.5 kilograms or 5.5 pounds, which is close to the average body size of living birds that have elongated windpipes. It appears that this long windpipe may have been present only in males of this extinct species, as in some living bird relatives, and the fossil preserves the bony base where a spur would have attached on the foot like that in chickens and turkeys, suggesting that the fossil bird is a male. The ancient Hezheng landscape with the tall Tibetan mountains in the background filled with extinct rhinoceroses, three-toed horses, and ostriches, also had the loud call of a male pheasant echoing across the savannah. 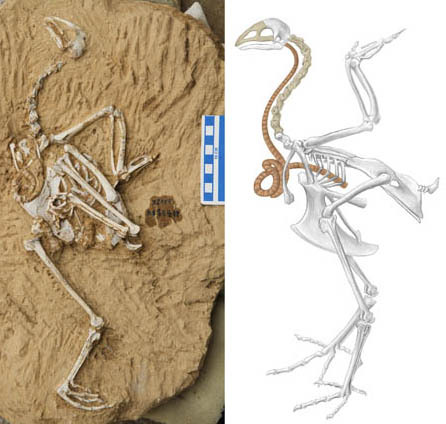 Over the last few years, work by LI Zhiheng in the Hezheng fossil deposits has produced other spectacular skeletons including those of an extinct vulture, and an early falcon, that even preserves its last meal of rodents. As of yet, none of those other fossils provide the same clue as to how they sounded in life. The authors of the published study are LI Zhiheng, Thomas Stidham, DENG Tao, and ZHOU Zhonghe of the Institute of Vertebrate Paleontology and Paleoanthropology (IVPP) of the Chinese Academy of Sciences in Beijing, Julia Clarke of the Jackson School of Geosciences at the University of Texas, and Chad Eliason of the Field Museum of Natural History. The research was supported in part by the Chinese Academy of Sciences, the National Natural Science Foundation of China, and the Gordon and Betty Moore Foundation.